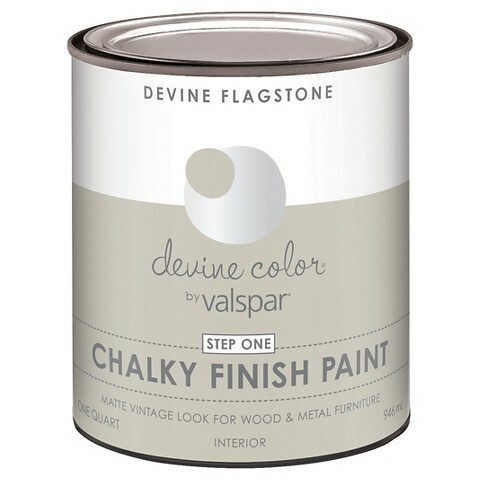 This post has been done in collaboration with Devine Color by Valspar. All opinions and comments are 100% mine, I only promote products I believe in. 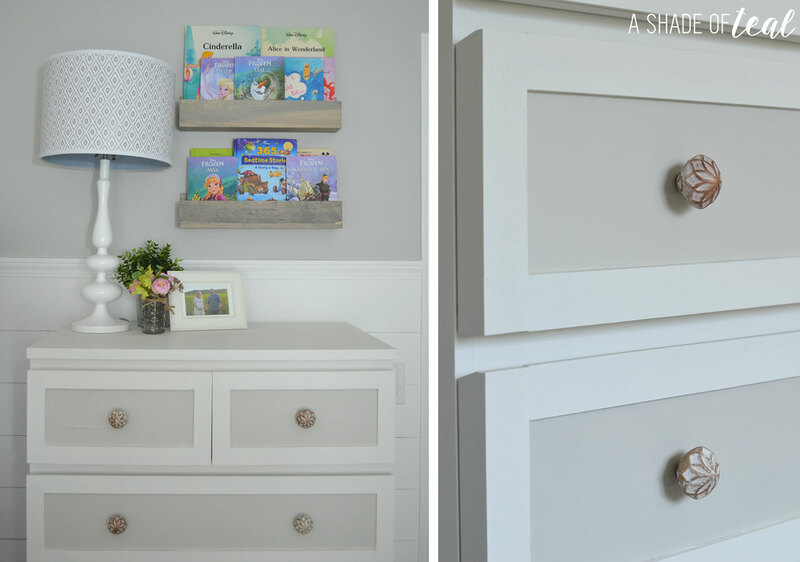 In case you missed my recent Nursery makeover, I made over a old IKEA Malm dresser. I’ve been wanting to redo the dresser for some time. 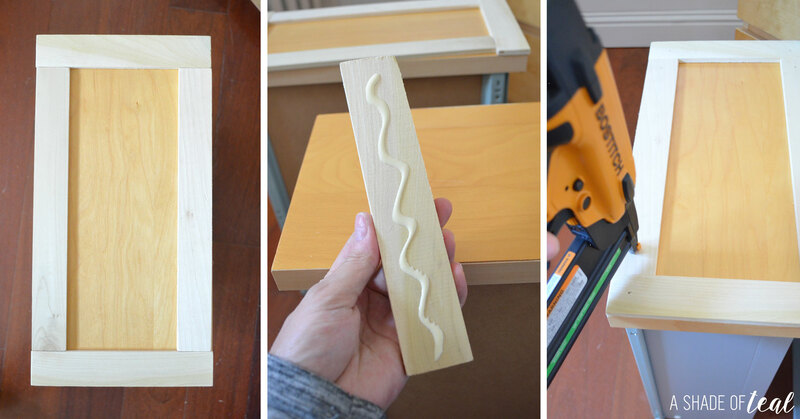 At first I planned on buying the already pre-made pieces that you just glue to the dresser, but once I realized the cost I decided to try to replicate the pre-made pieces myself. Here was the before of the Malm dresser. 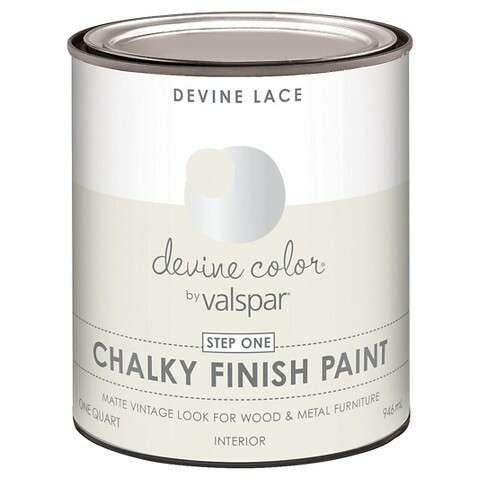 Chalky Finish Paint from Devine Color by Valspar in Lace & Flagstone. You can find this at Target. Hardware Knobs, mine are from Hobby Lobby. HERE’s a similar option. First I cut the poplar trim to size. 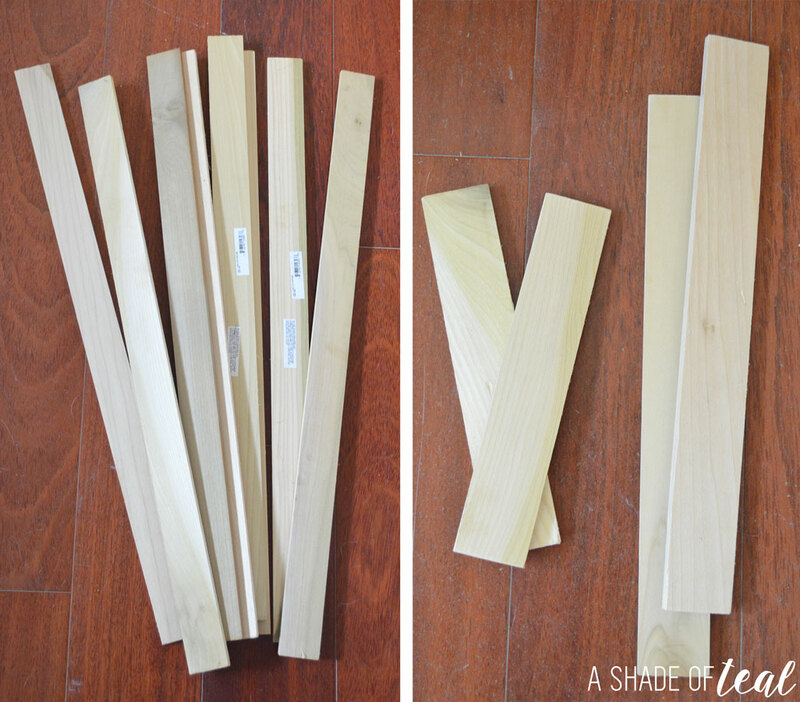 Make sure you measure your dresser to get the most accurate cut. But I cut (12) at 8″ long, (4) at 12 5/8″ long, and (8) at 28 3/8″ long. I laid all the pieces down to make sure they would fit. Then I glued and nailed them in place. 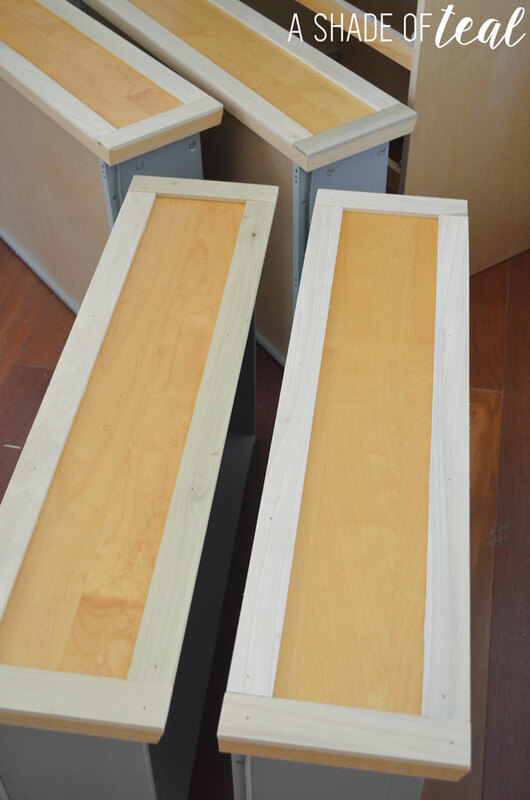 Once I finished all 6 drawer fronts I spackled the nail holes & caulked the seams. Sorry, I forgot to take a picture of this. I let everything dry overnight. The next day I sanded the trim and then pre-drilled the holes for the new hardware. Finally you can start painting. I first painted the trim in Devine Color Chalky Finish Paint in Lace. This is a pure white color. 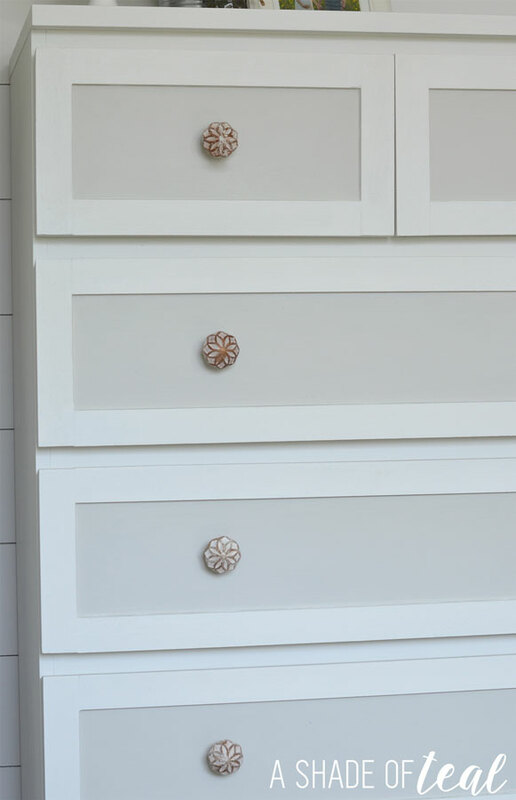 I honestly can say this chalk paint is pretty amazing. I only had to paint 1 coat with minor touch ups after. Plus it cleaned up so well off my brushes with just soap and water. Once all the drawers were dry I moved on to painting the inside of the front with Devine Color Chalky Finish Paint in Flagstone Grey. When I first opened the can I thought they gave me the wrong color since it appears so close to white. It also painted on really light, but once this color dried it was the perfect shade of grey. After everything dried I waxed the entire dresser and then installed my new knobs. 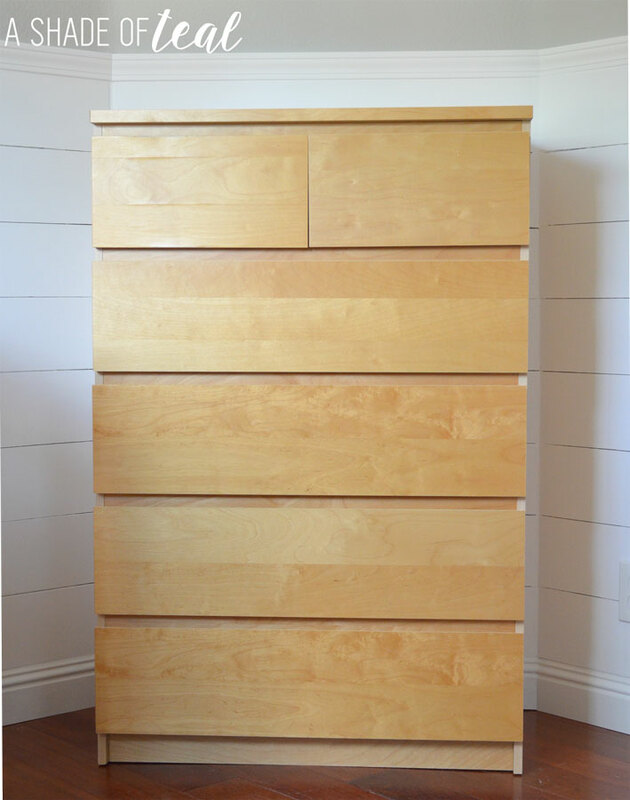 Here’s the finished IKEA Malm Dresser Hack. 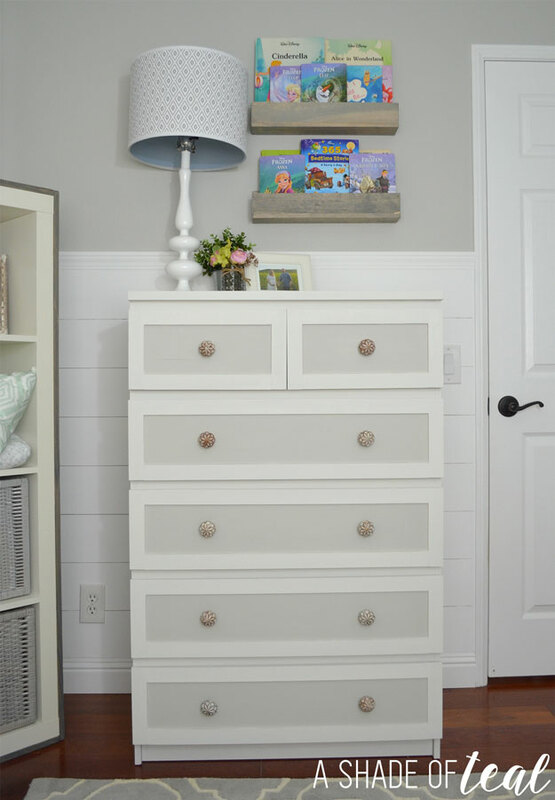 I love how it turned out and how its fits into my Rustic Glam nursery. 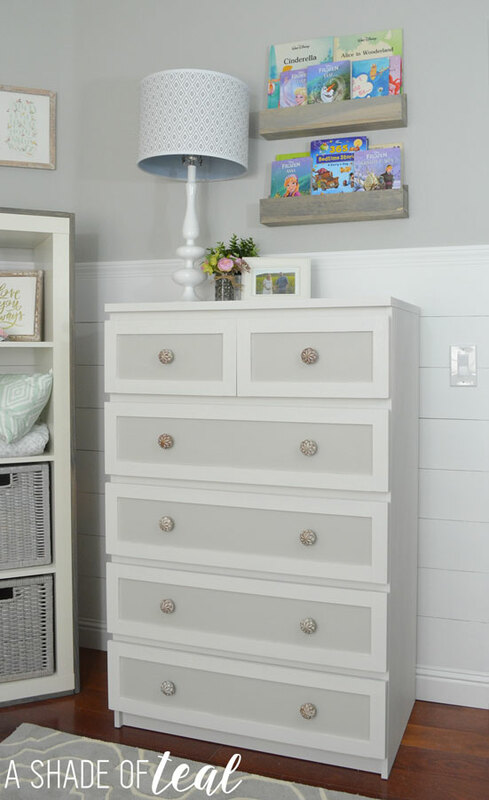 In case you want to see my full Nursery Reveal and source list check them out below. I have this dresser and want to fix it up. 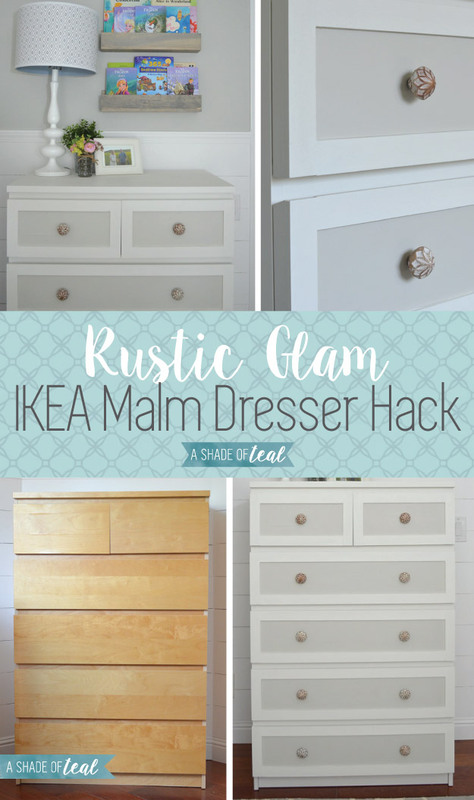 Did you sand the actual dresser before painting or just the trim. Hi Lauren- I just sanded the trim I added. No need to sand the dresser since its not real wood and chalk paint will stick right to the dresser. Thanks! Im a newbie, what does it mean to wax the dresser? It’s a way to finish the piece instead of using a poly-acrylic finish. 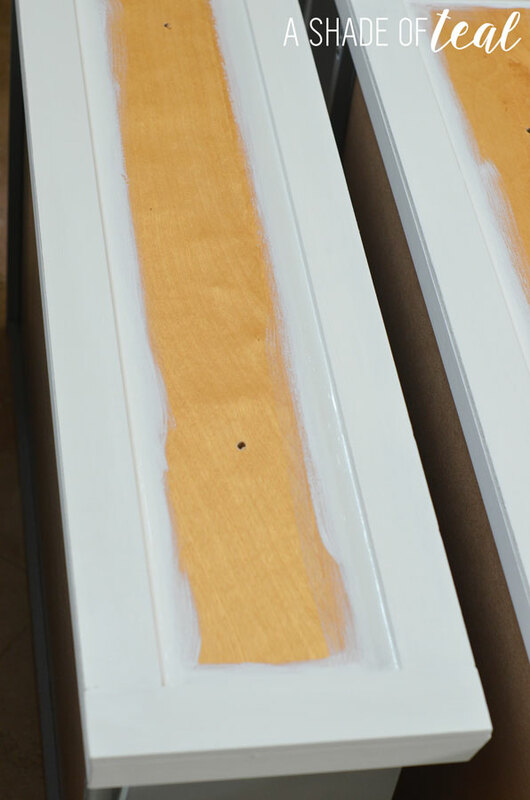 I made the mistake of refinishing (sanding by hand) an ikea bookshelf – are there any issues with the paint sticking to malm? did you do any priming or sanding? and what is waxing? I clearly am late to the party… My master is in dire need of a man cave overhaul… Love the nursery!!! lookss great! Thank you! This is beautiful. I can’t wait to redo my dressers. Thank you so much! Your nursery is amazing! I also have this dresser, but I have 2 side by side. How do you keep the paint from peeling or chipping? 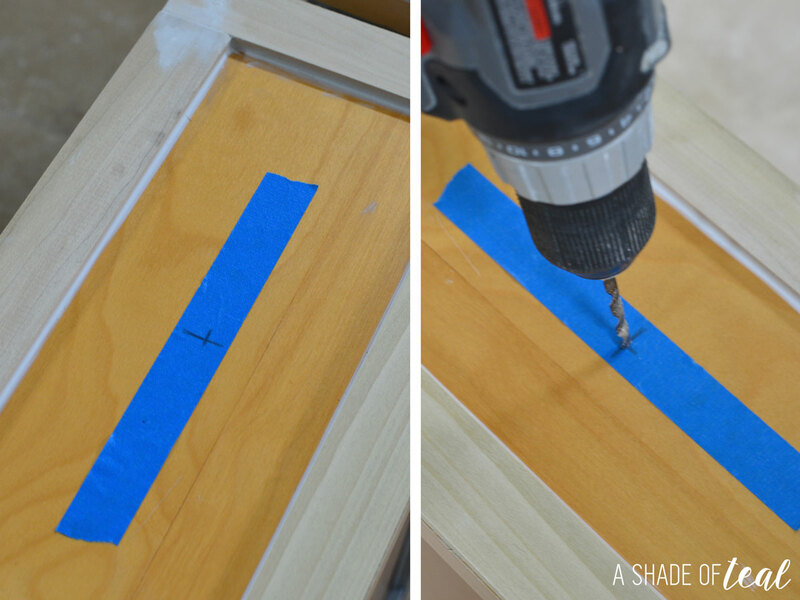 I want to try this but an afraid I’m going to end up ruining my dressers. Also how do you do the waxing? Hi April! This dresser has been done for some time now and I haven’t had any chipping issues. 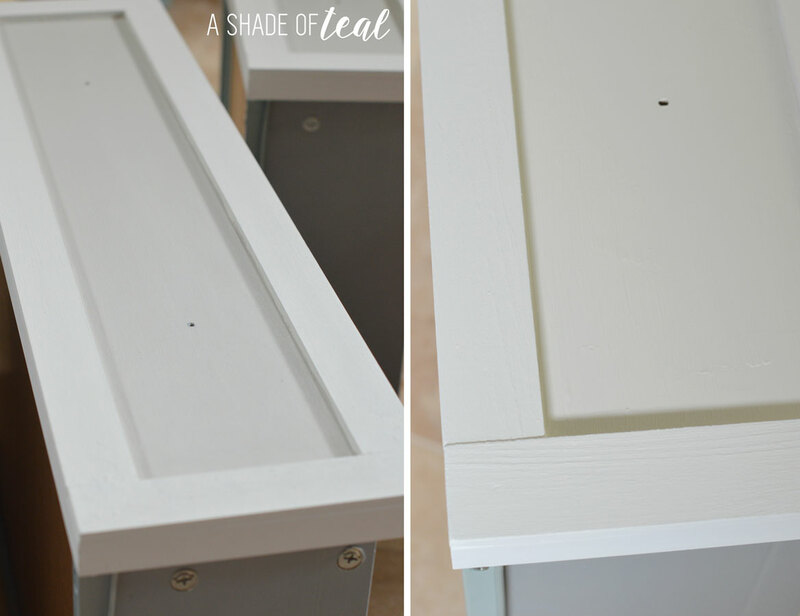 The chalk paint works great over IKEA furniture! Then directions on how to apply wax will be included on the wax you buy, but you pretty much apply it by hand with a rag, almost like your polishing the piece. It’s really simple to apply. Good luck!